You can never predict what you will encounter on the road. This includes debris, dirt, sleet and snow. Your windshield must be strong enough to withstand the elements, and the windshield always stands a chance of being damaged. The team of experts at CarRegistrationAdvisors.org understands that no drivers look forward to replacing their windshields, but if your windshield begins to show damage, you may want to replace it sooner than later. Use these tips to determine if a possible crack requires you to replace your windshield. Wintery conditions cause a ton of problems for drivers. Freezing temperatures, ice and snow are responsible for a fair number of necessary vehicle repairs during the winter months. Fluctuating temperatures, heavy snow and hail can cause your windshield to chip or crack. The team at CarRegistrationAdvisors.org recommends examining your windshield for winter damage. If you see any small chips or cracks beginning to form, it is a good idea to have your windshield repaired or replaced. You don’t want to be driving with a dangerous windshield that can cause injury to you and the passengers in your vehicle. The glass of your windshield withstands a great deal of damage as you drive. Rock, gravel and other road debris can cause significant damage to your windshield, especially when you are driving on the highway. The impact of debris hitting the glass overtime can lead to pitting, which can greatly obstruct your view. Windshield pitting is the appearance of small craters in your windshield caused by the wear and tear of flying debris while driving. These craters may cause a glare when the sun hits your windshield. This can make it extremely difficult for you to see, and windshield pitting can become extremely dangerous. The more pitting your windshield has the less sturdy it becomes. 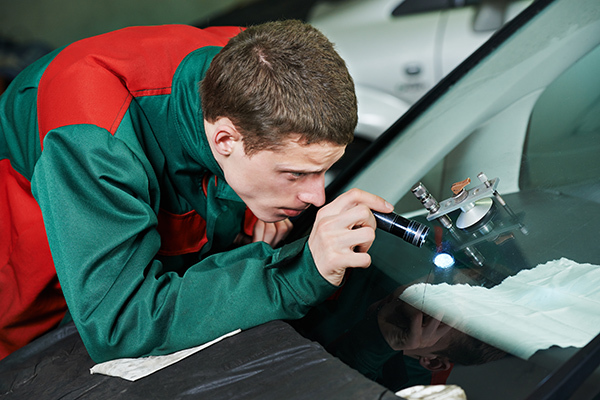 The experts at CarRegistrationAdvisors.org recommend having your windshield examined or replaced if you are having trouble viewing the road due to suspected windshield pitting. You don’t want your windshield to give out as you are driving! Even the safest of drivers cannot avoid being hit by unexpected debris. Your windshield is relatively durable, but sometimes a small crack can lead to something much more serious. You may think a small crack is nothing to worry about, but if it is in your field of vision, you may mistake it for another car. This can lead you to swerve and possibly cause a collision. A small crack can have a spider web effect and expand due to general wear and tear or an extreme drop in temperature. Even the smallest of chips or cracks can impair your vision while driving and hinder the safety of you and other motorists. Repairing or replacing your windshield can ensure the safety of your passengers and you, and you can have peace of mind that you will not suffer unnecessary injuries in the event of a traffic accident.